Chronic inflammatory conditions that go undiagnosed or untreated can often damage the intestinal tissues, creating an almost endless loop of suffering. 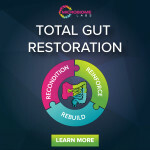 In order the end this cycle, these damaged intestinal tissues require some serious attention and healing. Step one is Reconditioning the intestinal tract by increasing microbial diversity and encouraging the growth of key health-promoting and commensal gut bacteria. Once this has been established, step two is to Reinforce the beneficial microbial changes by increasing the growth of keystone strains for a healthy microbiome. Strains like Akkermansia muciniphilia, Faecalibacterium prausnitzii, and Bifidobacteria are the cornerstones for a healthy microbiome. Once they have been established, feeding them precision prebiotics to increase their hold in the microbiome will initiate both healing and protection to the intestinal lining. Only at this time will it be possible to Rebuild the mucosal layer and heal intestinal barrier function. This article will show you how to effectively restore the health of any patient, using this unique layering therapy.